Football players describe the thrill of the game and their teamwork. The sunset created a pink honey glow over the field as the game was beginning to start. The game began with its usual hyperactive crowd. The student section’s chants and cheers electrified the team. “When you score, you get goosebumps from everyone cheering,” senior Alex Roush said. As the game began, it slowly became apparent who was gaining the advantage. “We were the complete underdog,” senior Grant Ross said. 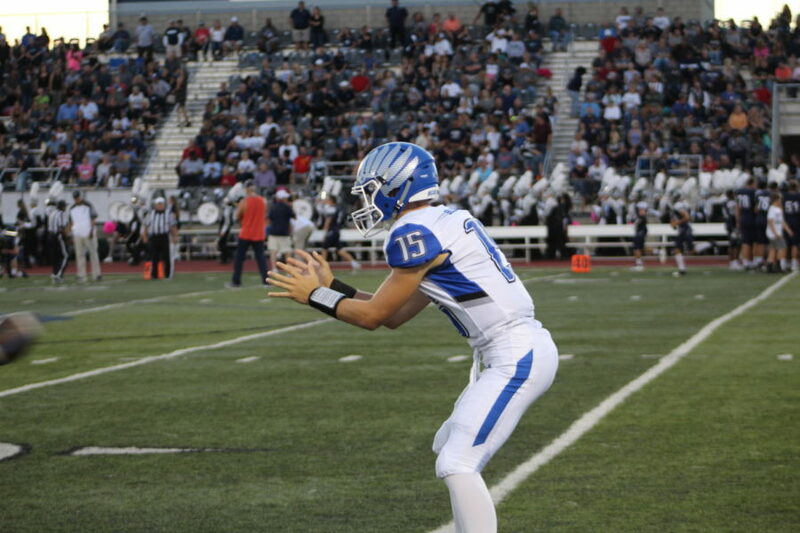 After being down for half the game on September 21 against Lee’s Summit North, the team as well as the crowd could feel a loss creeping upon them. “Nobody thought we were going to win that game,” Roush said. 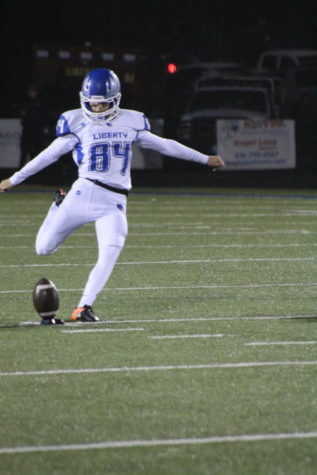 If the team were to give up, the Liberty Blue Jays were for sure to lose to Lee’s Summit. There was no way the team was going to make it out with a win had they been pessimistic. Luckily, that didn’t happen. “It started out like we weren’t going to win, but we just kept battling until we ended on top,” Roush said. Not only did the Blue Jays end with a win, but the school record for a field goal of forty-nine yards was broken by one yard. “I broke the school record during the game which is pretty cool,” Ross said. The team had won because they had something better than luck that helped them gain the upper hand, and that was teamwork. “Instead of just one person winning the game for us, the team had to get together and work as one to beat the other team,” Ross said. When the team joined the student section for the alma mater, a sense of reassurance fell over them. Football is more than just playing a game on Friday nights. That’s just one of the highlights of the sport. It’s about physical and mental training. Each player must be prepared for their rivals ahead. When people hear the word “football,” most think just how much physical training it takes to play the sport, but mental exercises are just as essential. “We watch videos of our opponents so we can study how they play and their tendencies,” senior Domonic Mesh said. The team does more together than practice their sport. They also participate in their own traditions and community service. “Events like our team dinners or community service volunteer projects allow our players to interact and have fun and that carries over to trusting each other during competition,” coach Chad Frigon said. Other factors, such as mentors and constantly seeing familiar faces also contributed to the bond this team has. “Our leadership and our community makes us close,” freshman Wentric Williams said. Roush has gained experiences he will always remember for years to come. “Playing in front of the student section has impacted my memories of the games forever,” Roush said. By participating in football, players create good work ethic, new mental learning skills, and achieve personal records. “For a machine to work, all the parts have to do their job,” Williams said.